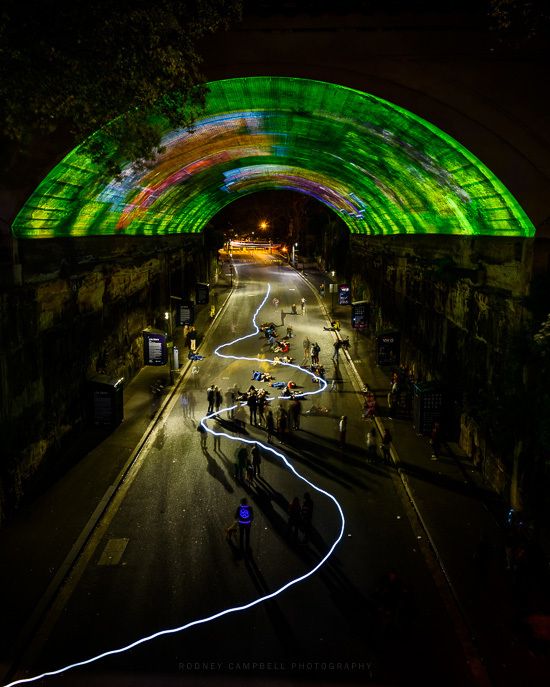 Thankfully Ana Andres had once again organised a Drink & Click for Vivid 2015. 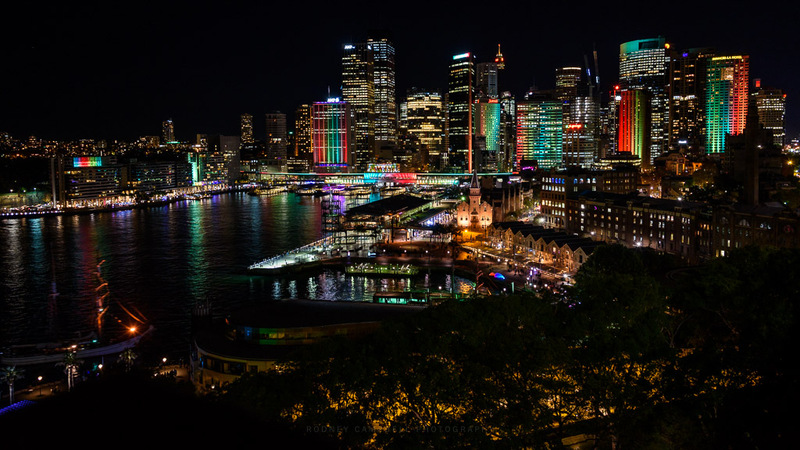 As I hadn’t yet been out to Vivid this year it was a perfect opportunity to get out with some friends for the annual photographic pilgrimage and check out what was on offer from this year’s Vivid 2015. Starting at the Orient Hotel in the Rocks for some food and drinks it was a chance to just sit and chat and catch up. Soon an hour or more had passed and we were off into the night to check out the nearby sights. To be honest I reckon this lit sculpture titled Affinity was the best of the pieces down in the park next to the MCA on Circular Quay. 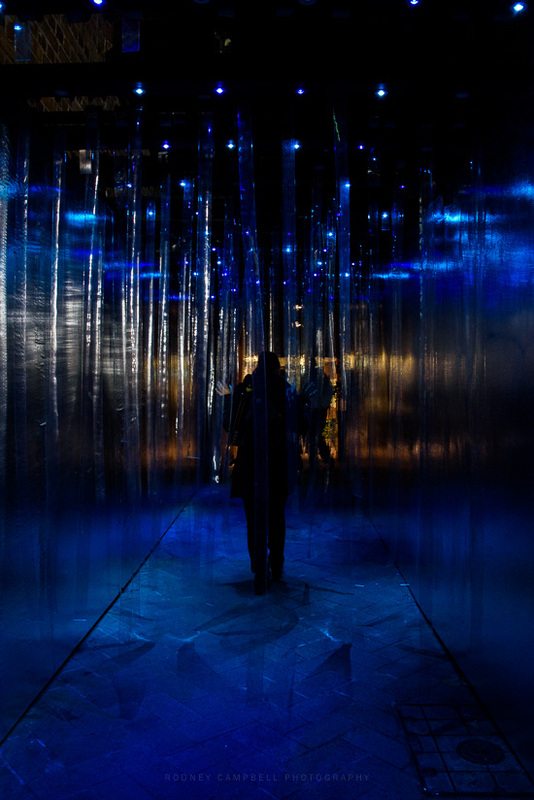 Designed by Amigo & Amigo and S1T2, Affinity raises awareness of Alzheimer’s disease and dementia. It’s a large-scale sculpture, made of orbs that light-up and make sounds when you touch them, depicting the complexity and connectivity of the human brain. 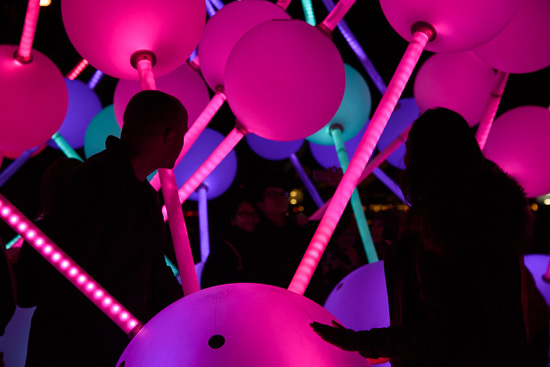 The orbs represent neurons in the brain and the transmission of messages, exploring the effects of Alzheimer’s disease. Then we were off back through the Rocks towards Argyle Arch and eventually up onto the Harbour Bridge to try some high perspective views of the Opera House and the City. 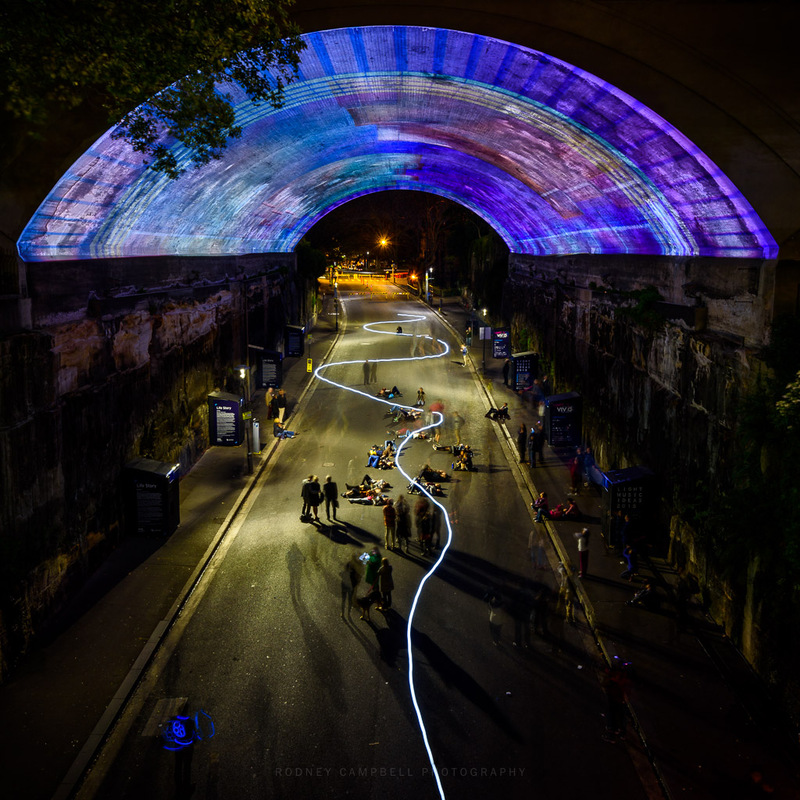 I was keen to check out the Argyle Arch this year as I’d not actually ever seen the projections in here and the last time it had been lit up light this was a number of years ago. 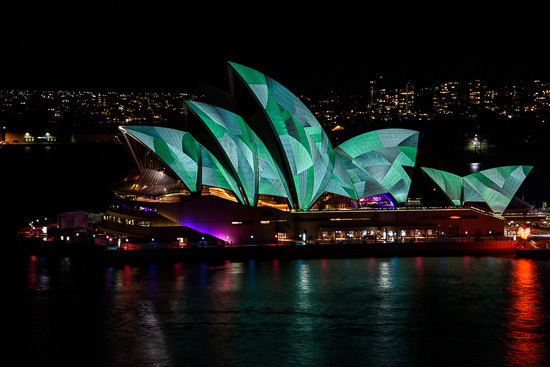 The projections in here were on an enormous scale – think IMAX screen sized. The entire streen had been blocked to traffic so it allowed people to gather underneath to stare upwards in fascination or just relax and lie on the road to enjoy the view. With so many people staying relatively still it allowed us to gather up on the nearby overpass looking into the tunnel and shoot across and down into the tunnel for a view which included the huge projections as well as the interesting glow of light in the street and the people and most importantly their shadows. Craig Murphy also kindly offered to do a few runs through the tunnel with an interesting light globe he’d brought, light painting the scene with a trail of light. So with me on the phone directing him we did a few runs through the tunnel with a nice long 30 second exposure. Up on the deck of the bridge at the southern pylon it was time to try some shots of the Opera House projections. To be honest the projections this year were uninspiring. I think Gerry summed it up best with his kids cartoon references. Then when the corner spot was finally free it was time to shoot what I actually came up here to try. 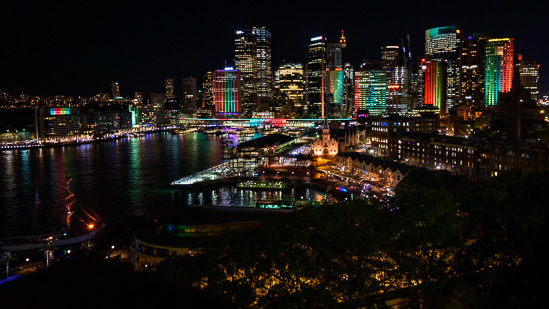 I was hoping to get a nice high vantage point view over the whole of Circular Quay with the city buildings surrounding it all lit up in bright colours for Vivid 2015. 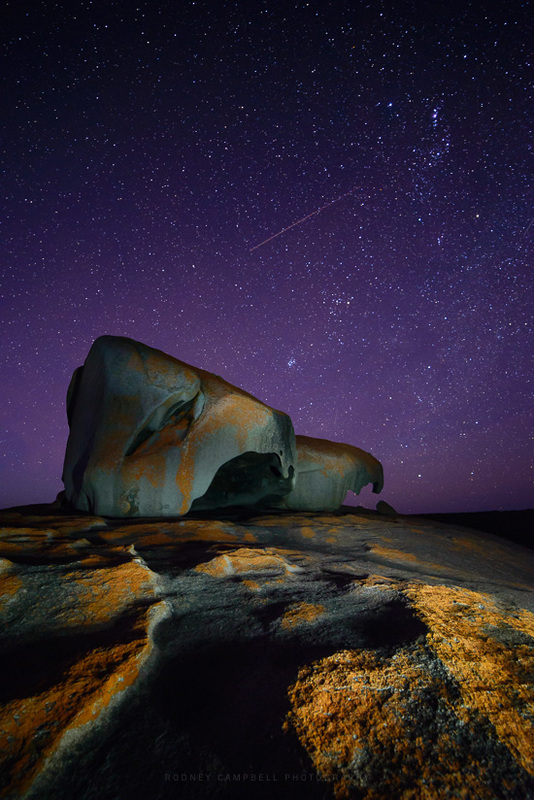 Ever since I knew I was going to be staying on Kangaroo Island I was hoping and praying that I’d get the chance to shoot the remarkable stars over the Remarkable rocks. Unlike the skies in Sydney where I live, there light pollution makes it almost impossible to see the heavens clearly. 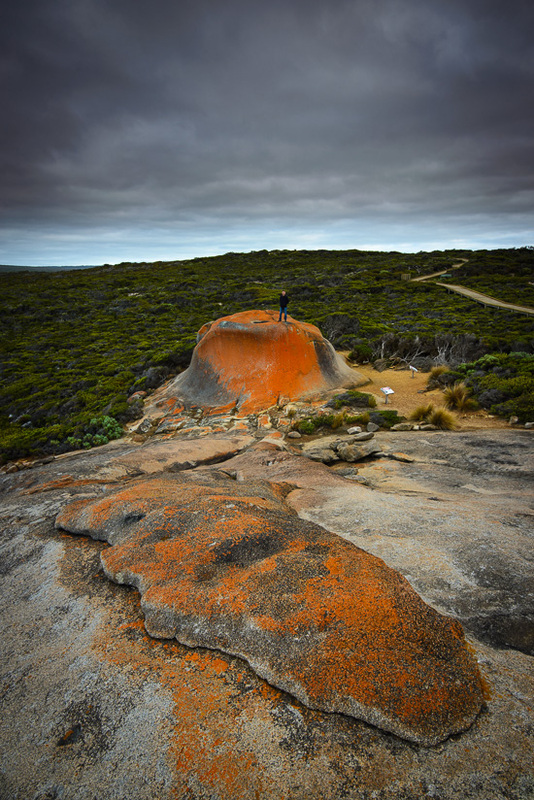 Kangaroo Island is perfectly suited to shooting the stars. This is the epitome of “dark skies”, with minimal light pollution at this very remote location in the most south west corner of the island. There is nothing south of here till you reach Antarctica. Unfortunately the skies had been overcast every evening of our stay so it wasn’t looking good. However on the second last night the skies looked clear just after sunset so there was hope. I’d been shooting at Admirals Arch with a newfound friend and photographer (Jarrod Koh who was over here with his family from Adelaide). 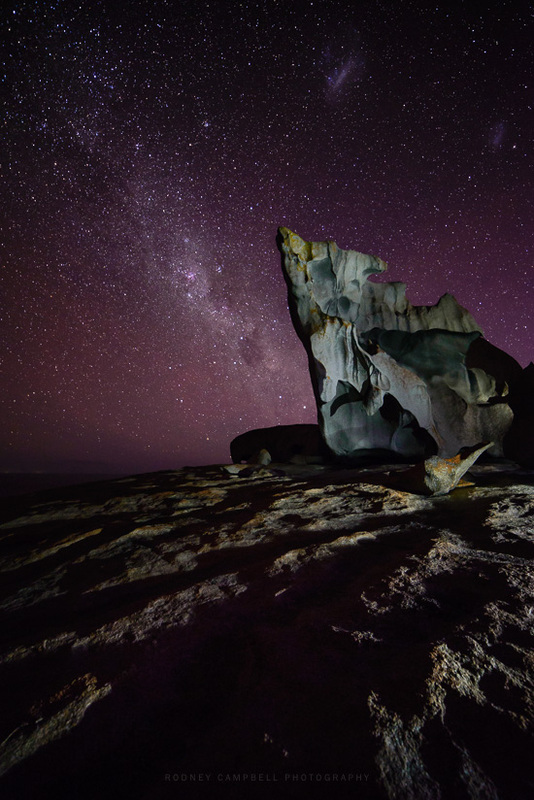 We decided to head to Remarkable Rocks in the hopes of using starry skies. Jarrod was aiming to get some shots of a comet with the clear dark skies and I was just hoping to get some shots of the milky way over the rocks and then later setup for some star trails. The Milky Way wasn’t really in a great position at this time of year. The core of those remarkable stars and galaxies remained over the horizon and most of the star band ran sort of south to north almost directly overhead. Still it was very dark and clear and so the stars were very visible. Whilst Jarrod setup his tracker for his Comet, I went wandering looking for compositions I could work with and light paint. The first image above was one of my first (around 10PM) and probably my favourite from the evening. 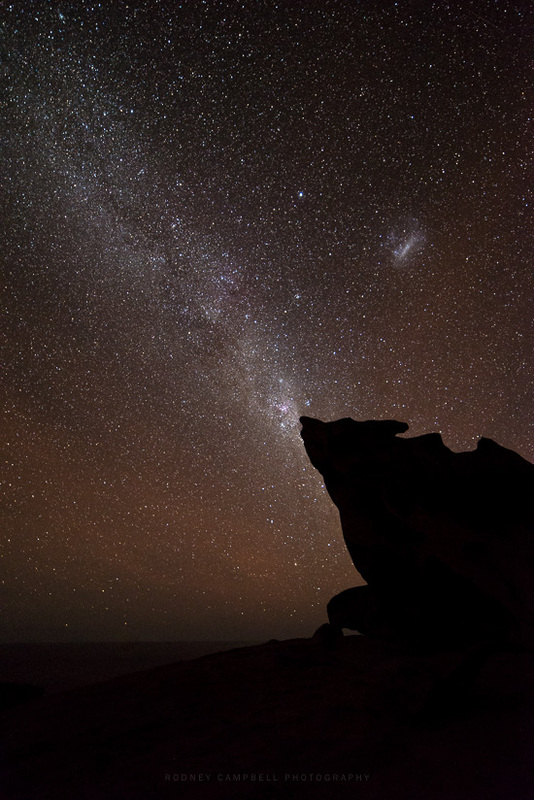 This is looking from the south side facing northward up at the Remarkable rocks with those remarkable stars in the sky. This one from the northern side facing more south east and including the milky way with this fabulous rock shape. 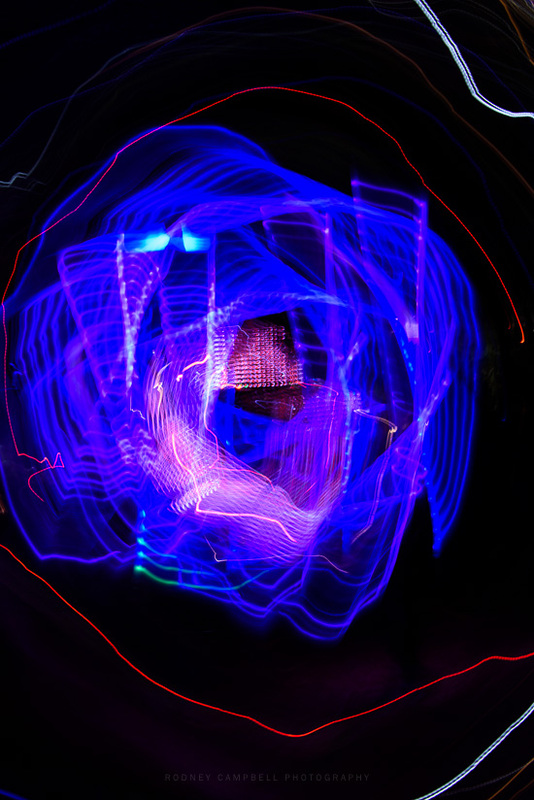 I think the secret with shots like these – other than the composition and the technical aspects of the shot (shutter, aperture and ISO) – is the light painting. 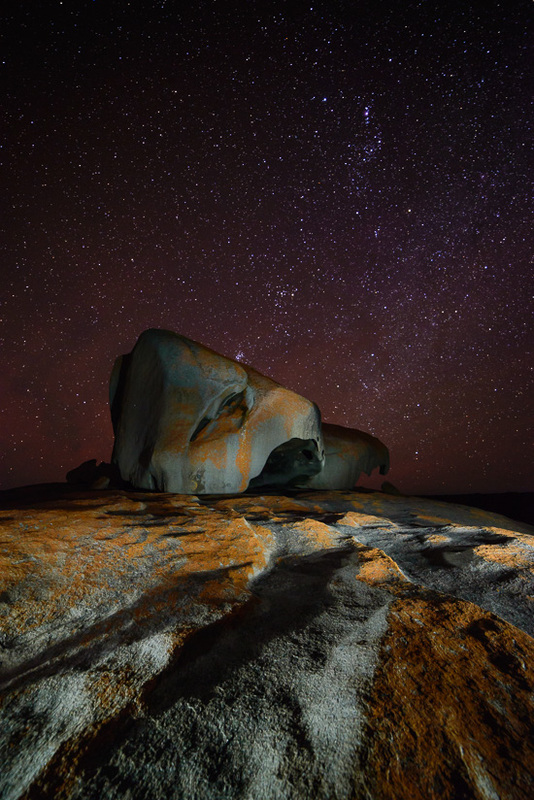 Both the remarkable rocks and the remarkable stars as their name implies are quite remarkable, but without the light painting you essentially have some stars in the sky over a black silhouette. The silhouette can work (as seen below) but only if you work the silhouette into the composition. It’s also not about just adding flat fill light either. Sure you can light the rocks like it’s daytime but personally I don’t think it generates the right feel for the scene. This low more directed lighting with lots of shadow, lines and texture I think produces a much more interesting and satisfying look. Then at around 11PM the heavy clouds came through from the south west and completely covered the skies :(. The remarkable stars were done and unfortunately star trails were right off the menu. Still I was very happy for the hour we did have here with these amazing sculptures of nature. Truly those remarkable stars were just that and I was satisfied with what I had in the can. 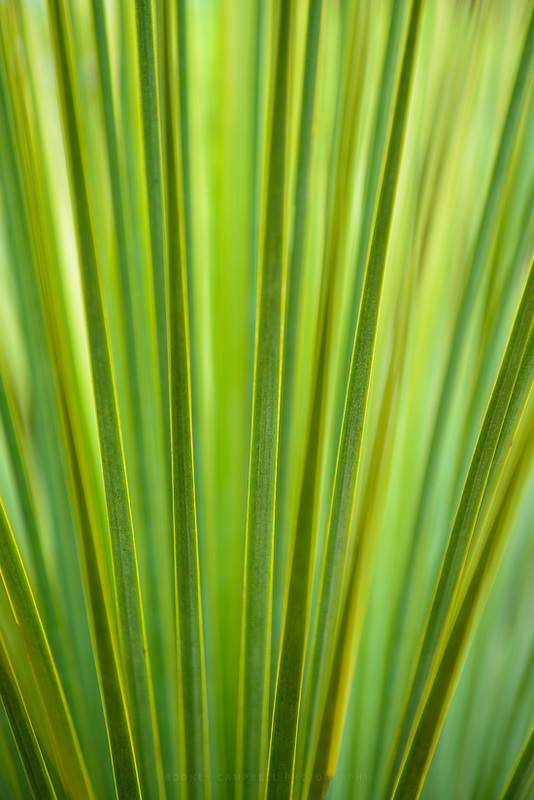 Sometimes detailed ‘scaping and a more concise view yields interesting results. 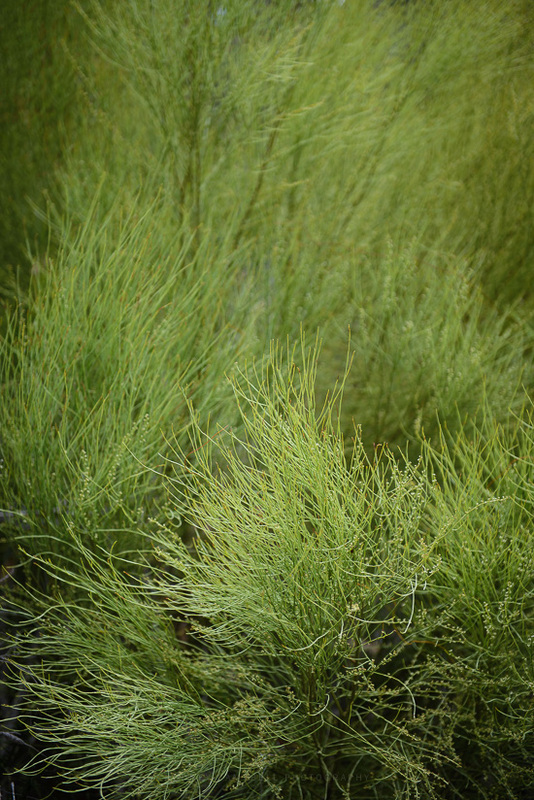 As we were exploring the Platypus Waterholes Walk today I saw it as a chance to hone those lesser used skills and shoot some flora as art. Unfortunately we didn’t get to see even a hint of any Platypi but the walk was pleasant enough on this lovely crisp clear day. 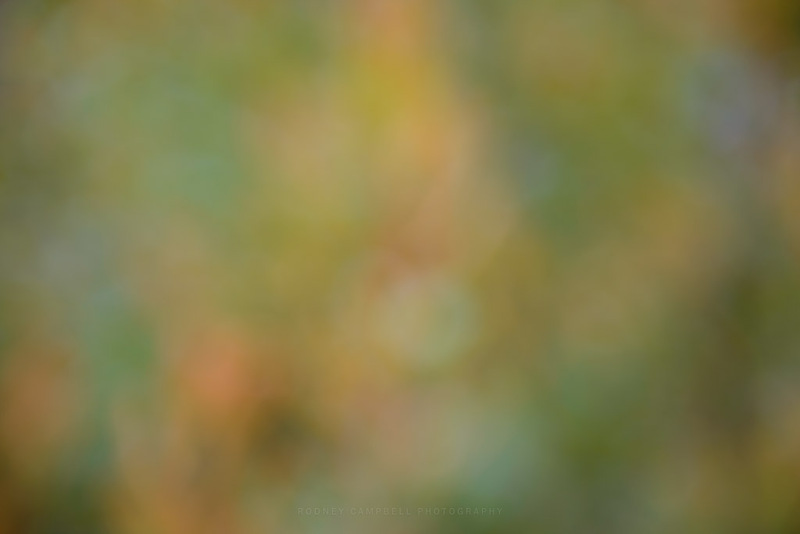 I “crafted” another one of these shots by placing this very red leaf on the face of this exposed cut trunk. Whilst it did stand out really well against the silvery tones of the weathered wood it was however just “too flora fake” :). It was 8:30AM and now more than two hours after sunrise at Remarkable Rocks. Still no-one was here other than the one other lone photographer who’d braved the early morning here. The upside of shooting at a very remote location like this at times like this is that with no-one around it’s very easy to create wide expansive images without having to worry about crowds of other people in your shots. When I shot here at sunset a few times I tended to use a longer lens (and a lot of patience) to get more isolated views without other tourists in them (especially as they tend to be climbing all over the rocks). I saw my newfound photographer friend photographing this smaller mounded rock off to the side of the main granite base. It’s right near where the path comes out so you basically see it and walk past it to get onto the granite base of Remarkable Rocks. She was setup down near the bottom of this slope quite close to the rock. I decided to setup a shot up here to include this large interesting orange slab in my foreground with the orange volcano (or pimple if that makes more sense :)) in the middle with the lush low green shrub covered land behind. Off to the right you can see the boardwalk which brings you down here from the carpark. Pro Tip: Most beginner landscape photographers get so enamoured with the amazing view in front of their eyes in the middle ground or distance that they forget to look at their feet. It’s one of the things which I think many photographers take for granted when they capture horizontal shots of the landscape in the distance (because it frankly looks amazing out there to the naked eye). 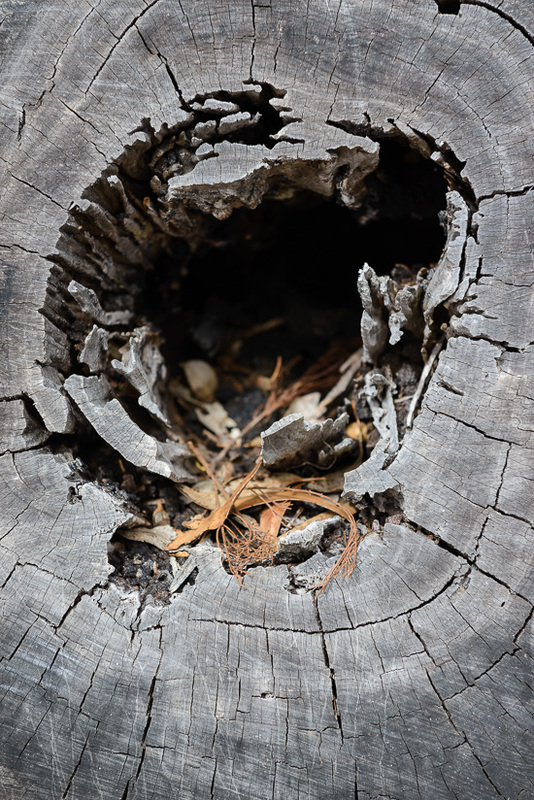 However when you look at these shots afterwards they look very flat and two dimensional – because they are – photographs by their very nature are two dimensional. What you sometimes need is something in your two dimensional frame which implies the feeling of three dimensionality. Often the easiest thing to do is connect the foreground to the background of the image in some way so that your eyes are drawn into and through the image. I waited and once she had finished her shots and moved on I decided to take mine. For something a little different I thought I’d add myself for scale and go down there and get in the shot. It’s actually pretty tricky getting up on that rock. It’s probably at least five metres tall with very smooth steep sides. All around there’s no actual cracks or handholds for climbing up so I found the best way up was to just gather some speed and run at it and hope you had enough momentum to get you near the top so you could grab in. I’m sure my friend thought I was crazy as she watched me do this. Now the real reason I’ve included the above image is to give you a frame of reference to the image below. 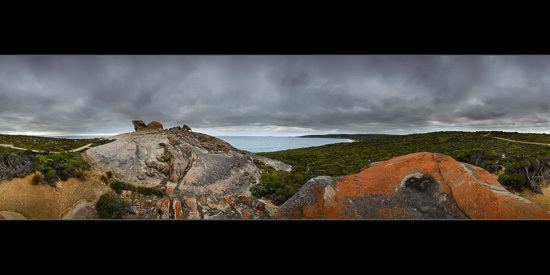 This Remarkable panorama is a full 360˚ stitched panorama comprised of twelve vertical frames taken at 19mm. The tie to the above is that I took this panorama standing on top of the pimple of rock you see me on below. Let me tell you getting both my tripod and gear as well as myself up onto this rock was no mean feat :). 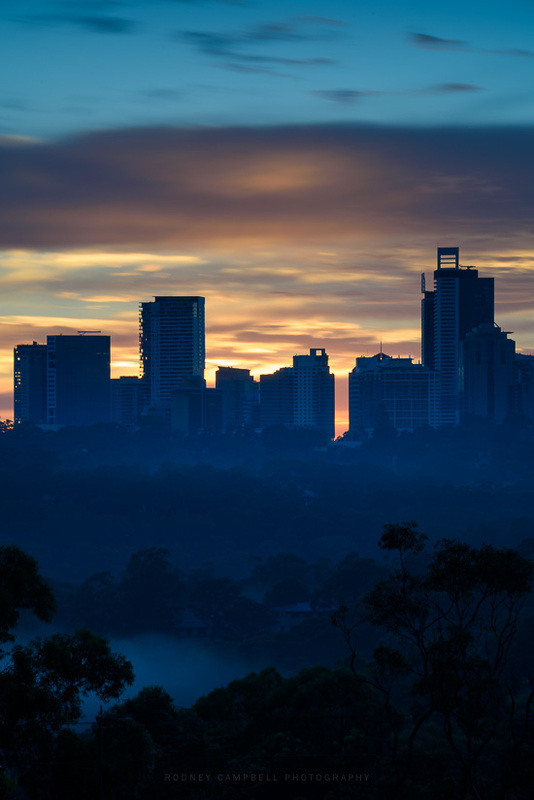 Just another day before the dawn… Waking to find the sky filling with wondrous morning colour whilst the valley below the city skyline is filled with fog and the whisps of early morning mist trying to obscure the treetops. Here it is right on sunrise (6:24AM) and I’m using a new lens for a little telephoto landscaping. This wondrous 28-300 general purpose lens thankfully has 77mm front filter threading which allows me to make use of my Lee filter system. I’ve dragged out this exposure from half a second to 30 seconds with the use of the Lee LittleStopper to help smear the sky for the look I was after.